The Collapse Levels command allows the user to collapse all levels below a chosen level. Collapsing all levels below a designated level automatically restores the columns to the default order, redisplays all hidden columns, clears all filters, filters all levels below the designated level on instance 1 or NULL, and hides all columns below the designated level. 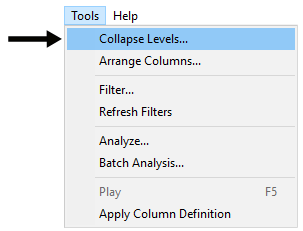 The Collapse Levels command may be invoked using the Tools menu or by clicking the Collapse Levels tool button. 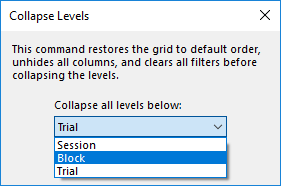 The Collapse Levels command displays the Collapse Levels dialog. By default, the spreadsheet is set to collapse levels below the lowest level of data (e.g., commonly the lowest level would be the Trial level). Use the drop-down box to select a level, and click OK. The spreadsheet will be refreshed to display all data at or above the selected level.